Shopping Our Stash Challenge 2 Oldies but Goodies! Hello! 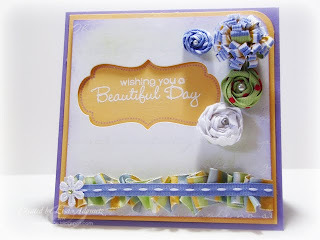 Welcome to our second challenge here at Shopping Our Stash: Oldies but Goodies! For this challenge we want you to go back, back, back into the untouched sections of your stash and find your OLDEST stamp or digi and use it! 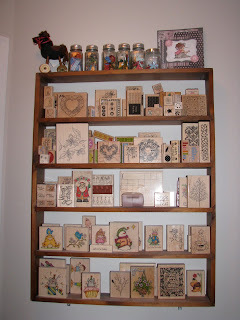 If you keep pics of your previous crafty projects, look back at when you started out. It was so fun to see my first attempts at card making! So, get those neglected stamps or digis out (or if you make another project- a layout, ATC, mini album, etc, find your oldest supply and put it to use!) Be sure to mention in your post somewhere a bit about how it fits the challenge! 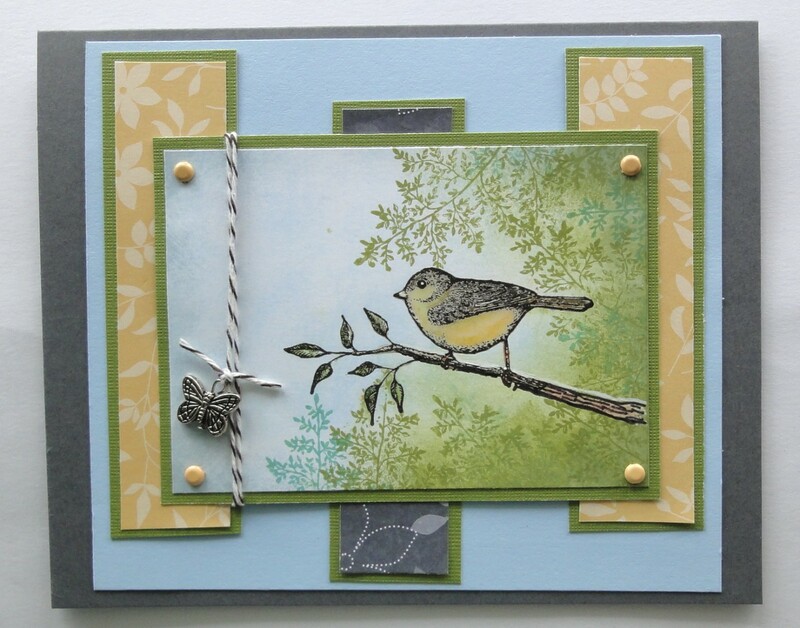 Stop back by on Friday to see the Top 3 from Challenge 1 and remember if you have participated in any of the challenges in May you will be eligible for the Monthly Prize Draw and for May the prize is a Ten Dollar Gift Certificate for Whimsy Stamps (digital downloads only). 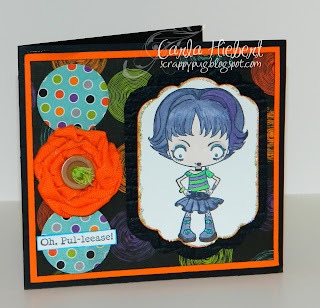 Take a trip down memory lane with the SOS Crew as we feature some of our oldest stamps! Pop over to the DT blogs to read more details on their projects and just maybe a trip back in time to our early days of crafting! Thanks for stopping by and we'll see you Friday for the Top 3 announcement! Happy Crafting! TGIF! The weekend if on the way and I hope you have some nice weather wherever you are! If you find time for crafting this weekend, how about trying your hand with some ribbon-inspired projects? Today we have some fabulous and fun projects to show you. The challenge this week is to use ribbon from your stash, dig out your oldest, or the colors you have the most of, or try somethng new! 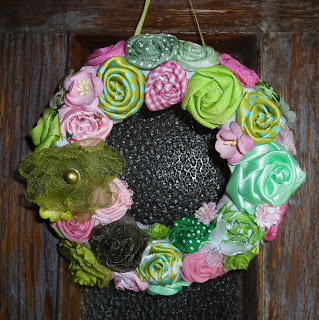 Leslie makes the most fabulous wreaths with ribbon! 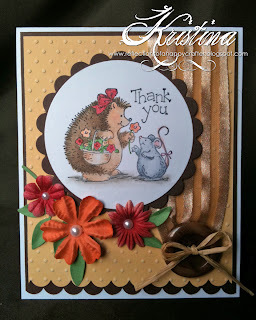 Here are a few examples and if you pop over to her blog, you will find all the details. Now check out these totally adorable ribbon-topped cupcakes Alica has whipped up! and I had to try my hand at something so came up with this wreath! *warning I've been told SHADES are required to view it! Be sure to stop by my blog to read my shocking confession too. So, get your thinking caps on, search your stash and join in the crafting fun! Be sure to link up your project to the challenge here. Remember, you can create anything as long as it follows the challenge to use your ribbon! SOS Challenge 1 Ribbon Rewind and Winners! A big thank you to all the ladies who took the time to give us a peek into their crafting spaces and stashes for the Kick Off Challenge! The SOS Crew really enjoyed the virtual tour of open houses! 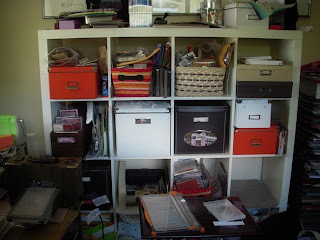 It was so neat to see all the different ways people store things and organize-even if we don't always keep things neat and tidy! (and I won't tell you how long I spent trying to figure out how to get a screen shot but you all will just have to trust me- I pressed the button under the watchful eyes of two pugs so it's all official! If you ladies email me using the contact me link on the page, I will get your prizes on their way! Now, onto the Challenge 1! or use RIBBON in a different way that you usually do- we have some great examples of that from out Crew! We have linked up some Resources as well a the top of the blog on the page tab that can give you some ideas. Also, you can take a look at the RULES linked at the top of the page for our challenges (they are easy!) and be sure to note somewhere in your post how you are fulfilling this challenge! We wanna know these things! 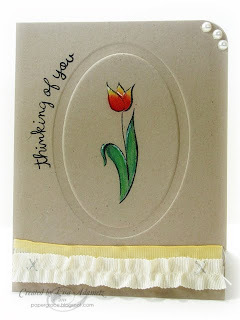 :) Stop by the individual DT blogs to get the inside scoop on our creations and what we are using! And come by on Friday to see more Ribbon Rewind Projects by the super talented ladies here! Leslie- fabulous weaving and pleating! 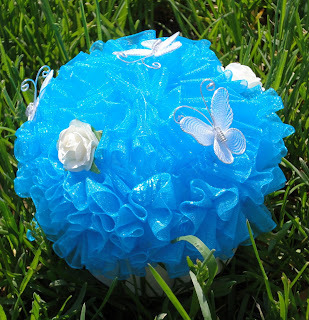 Lisa- gorgeous flowers and ruffle! 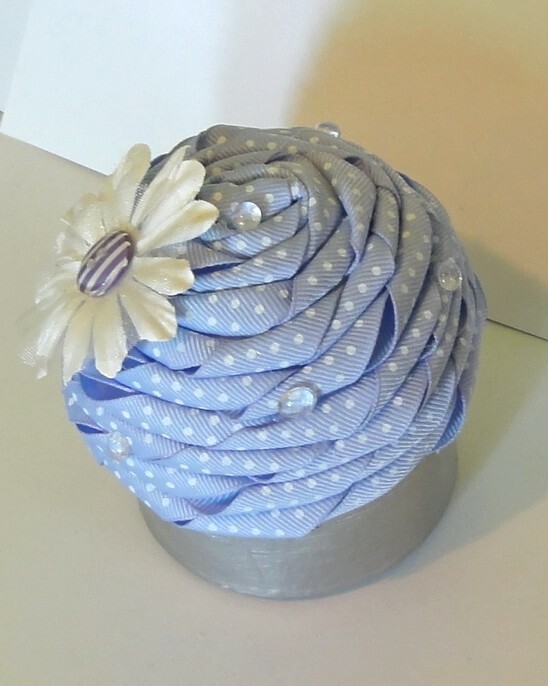 Carla- cute twisted ribbon flower! Kristina- beautiful ruffle and ribbon flower! Deena- fantastic colorful ribbon details on a layout! 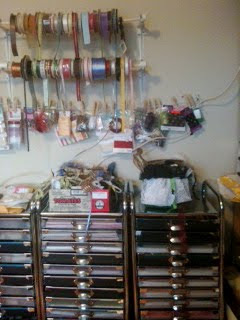 Marie- using her oldest ribbon stash! Alica-using the colors she had most of and an amazing ribbon rose wreath! 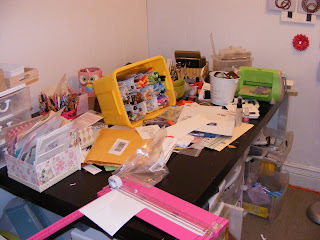 Thank you all for your kind comments and for linking up for the blog candy and the challenge by showing us your stash and/or craft space! We have really enjoyed taking a peek into your crafty rooms and seeing where it is you create your beautiful works of art! 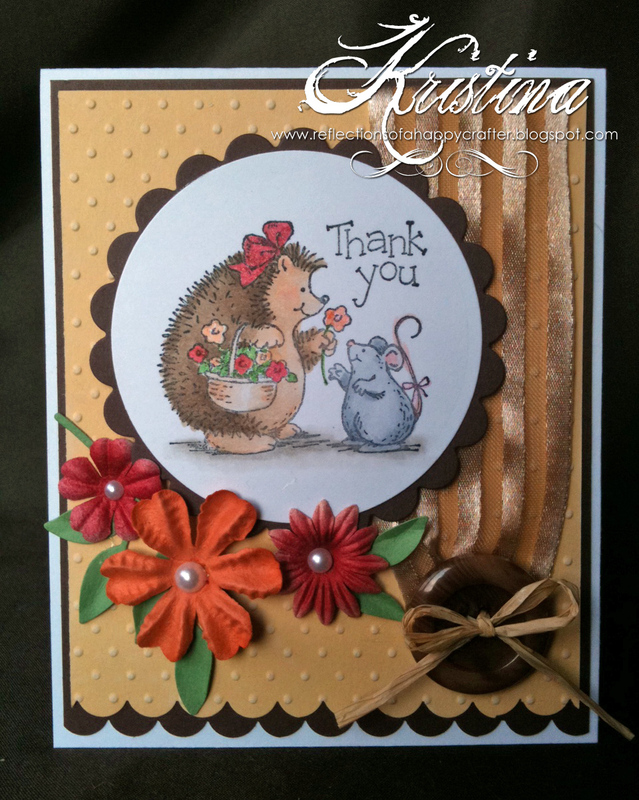 This week we are featuring the rest of the Shopping Our Stash Crew! Be sure to stop by our blogs to see more pics and say hello and if you haven't already, link up a pic or two or more of your crafty space or a part of your stash! We'd love to have you join us! Next week, May 24 will start our official weekly challenges! Until then, happy crafting! 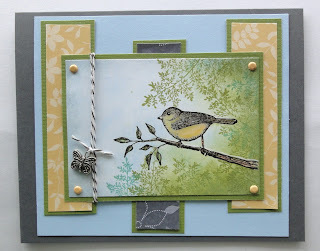 And Also we wanted to give a shout out to Lou for being the first entry into our challenge and to Kristie, who along with Lou, are going to be our Guest Designers for the month of June! And speaking of shout-outs- many thanks to Sharon at Plumrose Lane for being so helpful helping me get the SOS blog and of course my personal blog all dressed up with such lovely themes and extras! 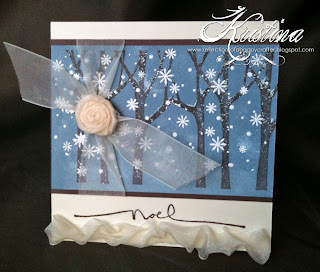 She has a great selection of themes and elements on her blog and in her Etsy store too! Shopping Our Stash Kick-off Open House Challenge! Thank you so much for stopping by today at Shopping Our Stash! We are thrilled to be "live" in blogland and hope you will help us spread the word and join us on Tuesdays while we work to use the things we have accumulated along the way! While we will normally be having a weekly challenge, the kick-off challenge will run from May 10-23 giving everyone plenty of time to participate! and myself, Carla/Carla's Corner aka ScrappyPug. And also let me thank each of the ladies who expressed an interest in being on the Design Team- I can't tell you how difficult it is to limit the number of people, and I am so honored that you took the time to apply. I only wish I could have had at least 20 spots to fill! Thank you so much and fortunately we will be adding some Guest Designers to the mix soon! For a little housekeeping information, please see the tabs under the blog header- clicking on those will take you to a new page with more detailed information, and the sidebar also contains links and other items you might find interesting. Our first challenge is Show US Your Stash! Think of this as a virtual open house! 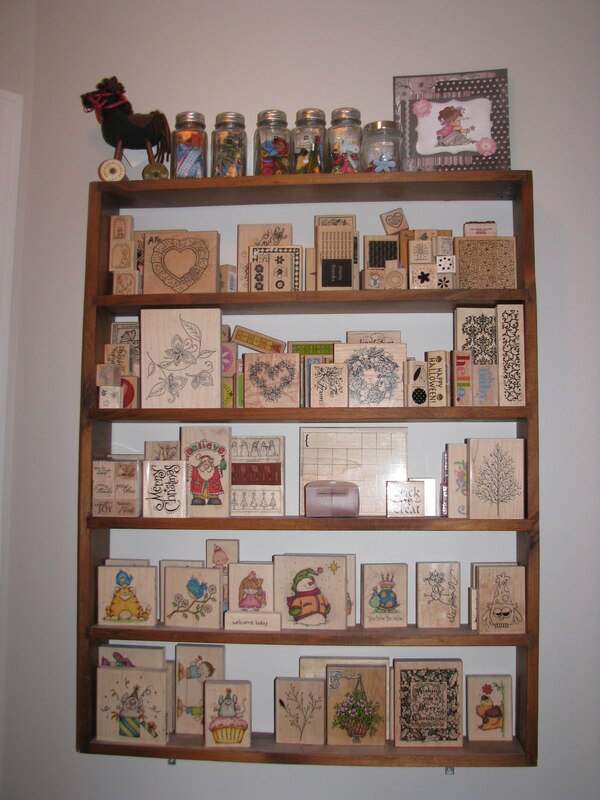 The Crew will be sharing our crafty spaces and stashes and we want to see yours! To participate, all you need to do is post a pic of your crafty space, part of your stash, some of your supplies, let us peek into those cabinets and/or see what you have on your work table! Just link it to our Challenge here and then come link your post with the blue froggy linker! You have two weeks so no excuses! No need to clean your spaces or go crazy organizing them for the open house- just show us your stuff! We will draw a random winner to be win the some gorgeous Wrinkled Seam Binding Ribbon from Prairie Bird Boutique! You will get to select which bundle you want from her amazing assortments! You will get three colors of 5 yards each. Thank you Patsy for graciously donating this prize! 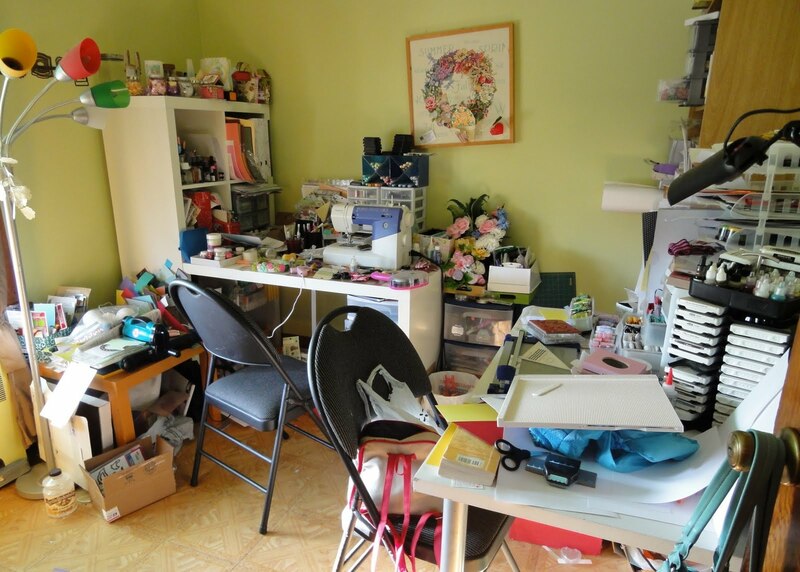 So to get things rolling, let's take a look at some of the Crew's quarters- go visit their blogs and see the rest of their pics and come back next Tuesday to see the rest of the ladies stashes! Don't forget to enter our blog candy give-away and take our badge for your blog! Link up On Part 2! Gearing up for the Challenge Kick-off! Check back in on Tuesday for a special two-week Kick-Off! The SOS Crew has been drafted into service and will soon be on deck to help us use our stash! We have a fun challenge lined up as a special two-week challenge that will get us thinking about our stash of supplies and what we need to do to start using it more effectively! Mark your calendars for Tuesday, May 10 and help us spread the word! The blog candy will be open until May 23 so let's see how many more we can to the list of participants!